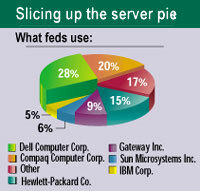 Reliability is what feds look for most in a server. But if something goes wrong they expect tip-top customer service and technical support from the vendor. That was a key finding in the latest GCN Reader Survey on servers. 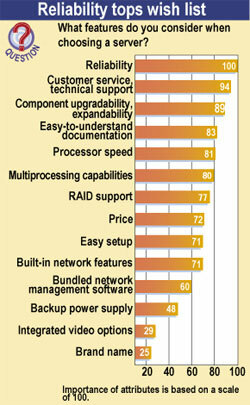 Users of servers from Gateway Inc., the highest-ranked brand in the survey, generally rated their machines tops for dependability and customer service. So did users of Dell Computer Corp. servers, which held the largest share of the market surveyed, at 28 percent. At Federal Public Defender offices in New Mexico, Oklahoma and Utah, Dell Power- Edge 2300 servers, installed about eight months ago, have been nothing but reliable, said Eddie Archibeque, the agency's systems administrator, who is based in Albuquerque. The same is true at district offices across the agency, which has standardized nationally on PowerEdge 2300 servers, Archibeque said. Although servers from Gateway claimed a far smaller portion of the market'9 percent'than the company's chief rivals, its users rated the machines high enough to push Gateway servers into the No. 1 spot in the quality rankings, ahead of Hewlett-Packard Co., Compaq Computer Corp. and Dell. Compaq was second to Dell in market share, capturing 20 percent of the installed base, followed by Hewlett-Packard, with 15 percent, and Gateway. Sun Microsystems Inc. and IBM Corp. had 6 percent and 5 percent, respectively. A fairly large swath of the base, 17 percent, was occupied by a mishmash of servers from about a dozen vendors, each holding 3 percent or less. Among those were brands from Digital Equipment Corp., Apple Computer Inc., SGI, Micron Electronics Inc. of Nampa, Idaho, and Acer America Corp. of San Jose, Calif. Customer service and technical support was what Blair Perkins, chief of supply and service for the Army's Special Operations Theater Support Unit in Hawaii, liked best about the Compaq ProLiant 6000 server that supports the organization's 37-node LAN. Perkins said his biggest problem has been with the SCSI disk drives. Perkins' organization has been using Compaq servers for about six years. 'We're looking at upgrading, and right now it's a toss-up between Compaq and Dell,' he said. GCN's previous survey on servers was three years ago'what now seems like the computer dark ages. Users at that time valued speed and expansion potential above anything else. The bulk of feds in that survey were using 166-MHz machines. In contrast to that survey, only a handful of feds complained about processor speeds in the latest survey. Nearly three-quarters of those polled, 71 percent, had servers with chips running at 400 MHz or faster. About 12 percent reported chip speeds of 600 MHz or higher. On the other end of the speed spectrum, 27 percent of the feds polled reported processor speeds of 333 MHz or less. The GCN Reader Survey is designed to give federal buyers detailed quantitative data on specific computer and communications products, as graded on a scale of 100 by federal users. This survey on server brands was part of a questionnaire mailed to 2,000 federal readers of GCN who on their subscription application forms identified themselves as buyers and users of servers. We received 93 responses to this part of the questionnaire. The servers in the survey were chosen because they represent the bulk of such brands used in government. This report lists results only for those brands that received at least eight responses. The overall rating for each brands was developed by averaging all individual attribute scores.